Compact true-rms meter for electrical troubleshooting. 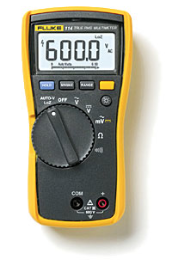 The Fluke 114 is the troubleshooting tool for “go/no-go” testing. It includes a feature to prevent false readings caused by ghost voltage. Also check out the Fluke 115 Multimeter, the Fluke 116 HVAC Multimeter with Temperature and Microamps, and the Fluke 117, the Electrician’s Multimeter with Non-contact voltage.